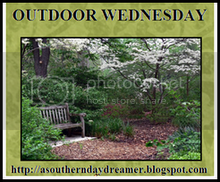 Another Outdoor Wednesday with lovely Susan from A Southern Daydreamer...go look! The Dappled Willow will have to get trimmed way back this year...can you see the pinkish foliage on the ends.. 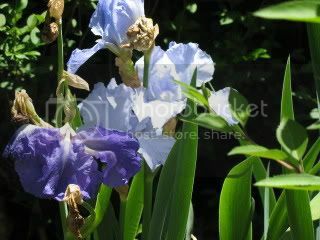 Some pretty pale blue iris....some bloomed some didn't get buds.. Here's a Banana Chocolate Chip Cupcake with a surprise in the middle..some cream filling...iced with chocolate ..
YOU ARE INVITED! My friend Debbie at Mountain Breaths is hosting a Chill and Grill Party June 13-14th...Please join her with a favorite grill recipe or tip! 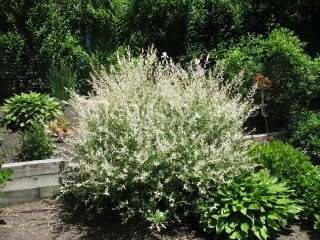 I had a lovely dappled willow at my northern home and just loved the pink tips in the spring. Your clematis is thriving beautifully and it just all looks so very nice. You had me drooling again. 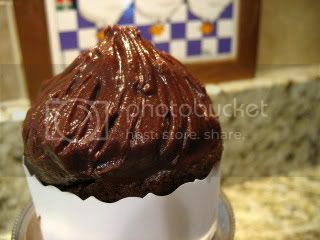 This time it was the chocolate banana cupcake. Yum. I LOVE this time of yr! 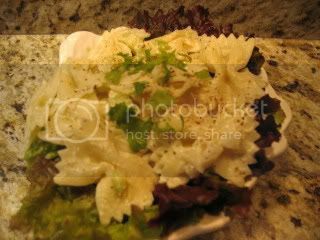 I made your Shrimp pasta tonight with the ricotta and lemon:) We ate out yesterday..we rarely do..it used to be one of our favotite restos.. we liked tonight much better. 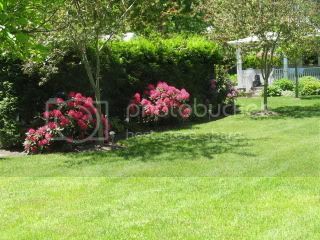 Kathleen, your property looks gorgeous.... What a beautiful rhododendron. And what a great sounding and good-looking cupcake. 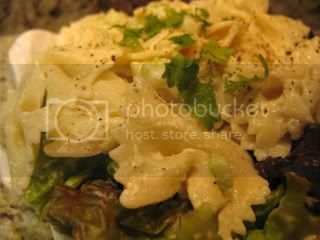 AND I love bow-tie pasta ... it's shape and the way it hold sauces. Your salad sounds really tasty. 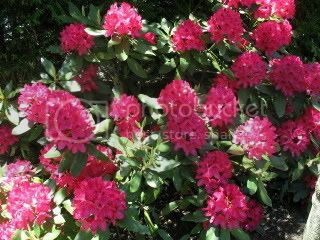 Your rhodie looks beau, even if the deer had a feast on some! 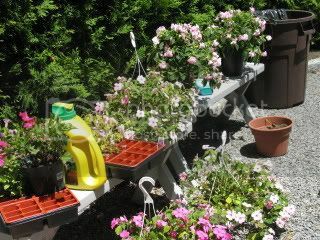 Your plantings ready to go into the ground is a familiar site for me also...love your yard - especially the clematis!!! I would so love to see a rhodie bloom here just once! I've had one for two years and nothing so far. Beautiful clematis! It looks so happy there. 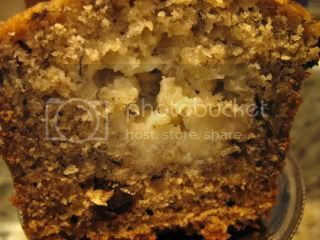 You are killing me with that Banana Chocolate Chip Muffin! Oh my, that looks good. Hello Kathleen, I love your outdoor post today. 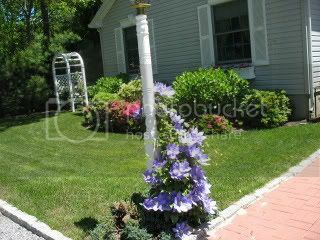 Beautiful flowers and a picket fence is a good wish list. It will look great with your white arbor. You did make me hungry and we just finished supper. Out here in Yellowstone it is two hours earlier. The thing is... dinner is never finished until I have dessert and I didn't get any. Sigh. 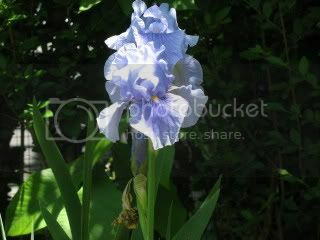 Your garden is beautiful as are the photographs of it. Thank you for sharing them with us. Have a wonderful day. Hmmm...everything looks yummy--orange juice in the salad? Interesting! I just love your yard, Kathleen. You have a lot of nice things blooming right now! You remind me of myself with the rest waiting to be planted...I can't seem to stop myself when I am at the garden centers!! Have you ever planted blueberries before?? I am thinking of trying blueberries and raspberries for the 1st time this year and could use any advice you have! Your goodies look delishious!! I will need to work outside a long time to make up for eating great stuff like this! Your yard is looking gorgeous Kathleen! I need to look that willow up. I've seen a plant like that and wondered what it was. Your cuppy cake is looking might fancy! Did you splurge on wraps or did you make them yourself? I have some scissors that would do that!! !